The Board of Directors (BOD) received a request from member George Moustakis through the Community Outreach Committee to consider some financial support to Help4Kids. The Board approved the request, and donation was made from Cabin Fever Tournament proceeds. On Thursday, April 12, 2019, the Club donated $1,000. 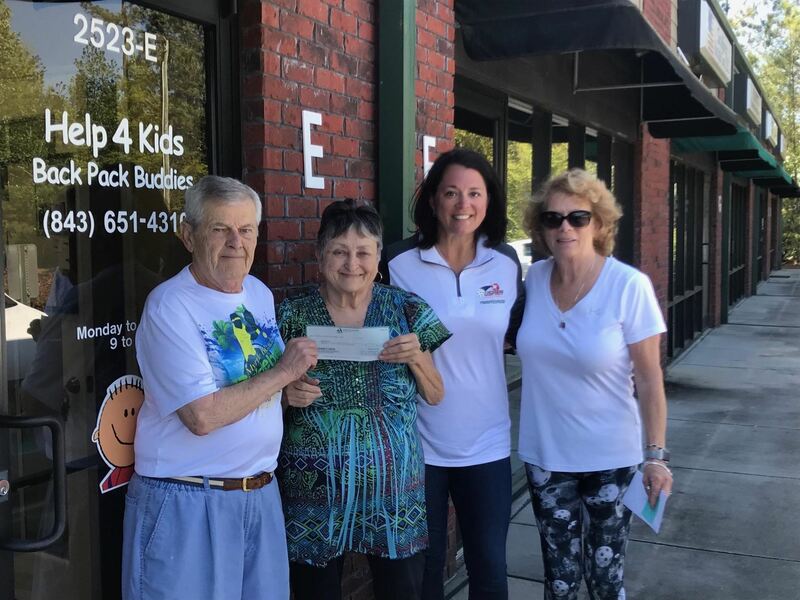 Attached is the picture of the George, Terri Loving, and Emily Taylor-Vice President giving Barb Mains at Help4Kids the check for $1,000.00. These funds will help with the supply of new clothing & shoes to schools as requested for children in need. If anyone would like to request the Club to donate to another local charity, please complete the attached Form and submit to Terri, Chair of the Community Outreach Committee, atterrilee.loving@gmail.com. All requests will be reviewd by the Board of Directors for approval. This form will also be added to the BOD & Committees website page under Community Service/Outreach Committee. We held the 2019 Cabin Fever Tournament at the MB Sports Center this past Monday and Tuesday. We had 134 players attend and it was a great success. We ran a couple hours last on Monday because we tried games to 21 which really killed the original schedule. We adjusted Tuesday and everything went well. We hosted the USAPA Mid-Atlantic Regional tournament this past weekend at the Myrtle Beach Sports Center. From all accounts, it was a huge success. We have 393 registered players for the weekend. The tournament ran smoothly and we finished every day between 6 and 7pm. There were 11 vendors in our vendor area and all were happy with the sales they had and number of people visiting their booths. We had food trucks there on Sat. There were a number of top 5.0 players attending and everyone seemed to have a good time. Almost all of the feedback was very positive and everyone I asked said they would come back. Kudo's go to all of the volunteers who helped make this event a success. We had a great Tournament Committee who worked for the past 10 months planning the tournament. We will be giving the proceeds of our efforts to our charity, New Directions, at our Christmas Party on Dec 6th. Strawberry picking at Hyman Vineyard and Farm in Conway followed by lunch in Conway at the Trestle Bakery and Cafe. We will finish the day at my home 2915 Midiron Court to enjoy the fruits of our labor with homemade strawberry shortcake. Meet at my house at 9:00 and carpool to farm. Picking is 10.00 a gallon and lunch is Dutch. When: Sunday, January 14th, 4:00pm-?? The club will hold a social Meet & Greet for appetizers and drinks at Carolina Ale House (near Broadway at the Beach) on Sunday, January 14th, from 4:00pm-??. The playoff game between NFC (TBD) and Minnesota is scheduled for 4:40pm, so please come to Carolina Ale and join us. MBPC is hosting the 1st Annual USAPA Mid-Atlantic Regional Pickleball Tournament on Oct 26-28, 2018 at the Myrtle Beach Sports Center. This is a brand new tournament in Myrtle Beach! Thanks for the USAPA Mid-Atlantic Director, Joe Borrelli for working with us to bring this event to Myrtle Beach! This will be a USAPA Sanctioned Event with an embedded Super Senior International Pickleball Association tournament included. More information will be coming out soon! Mark your calendars and forward to all your pickleball friends. Sign up on Pickleballtournaments.com starting 4/2/18. Hot dogs & hamburgers will be provided by the club. Everyone is asked to bring a side dish to share and please bring your own drinks. Members can bring a guest for $5. Let us know if you plan to show.